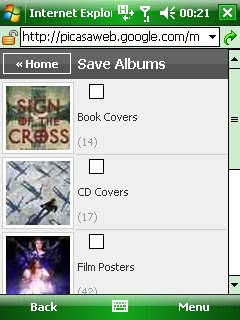 Picasa Web Albums has now been optimized for access via Windows Mobile 6 devices. Similar to the version recently released for the iPhone, this includes slideshows, searching and full image views. This version also makes use of the recently released Google Gears for Mobile for Internet Explorer on Windows Mobile 5 and 6 devices to enable offline viewing of your web albums. You'll see a "make photos available offline" link on the picasweb page and it'll prompt you to download and install Google Gears for the feature to work. In order to access the new Picasa Web Albums mobile interface, just visit picasaweb.google.com using the mobile version of Internet Explorer on any touchscreen-capable Windows Mobile 6 device. Any idea how to get the view on my desktop to NOT be in mobile view? For some reason doc/email is all fine. But when I click photos. Its all mobile.